After that I received a surprising amount of respect from the man who just tried to con me out of an additional…$7USD. Hey every bit counts right? Fortunately the flight to Singapore and the taxi ride to the Sheraton Towers hotel was smooth sailing. The taxi even tried to give me change back! Wow. One of my awesome coworkers in Manila let me use her EZ link card for the SMRT, which was so easy to use and very clean and efficient. The EZ link card even works in the taxis and at some convenience stores. From my hotel it was an easy walk to Orchard road, the Michigan ave and Fifth avenue of Singapore. There I met a friend of a friend who was kind enough to meet me for coffee and take me downtown to the city hall area. 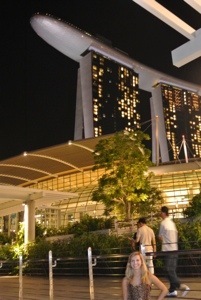 From there I went to the infamous Raffles Hotel and the Long Bar where the Singapore Sling was invented. Even though it was late, taking the MRT at night and walking back to my hotel was very safe. Not once did I feel uncomfortable. The following day we went to brunch at a great place called P.S. Cafe on Dempsey hill. The garden area outside was adorable and the food was every bit traditional Sunday brunch, which is something I hadn’t had in say…three months or so. Plus they had shoestring truffle fries which are a personal favorite. Outside of the restaurant there was, what looked like a koi pond, with some the largest fish I’ve every seen. 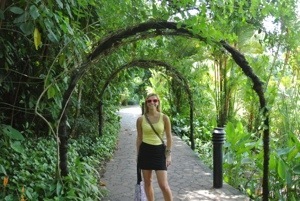 We continued our Sunday fun day to the Singapore botanical gardens, which is also easily accessible from the MRT. Apparently it was modeled after Central Park in the sense that admission is free and they encourage picnicking and outdoor activities. 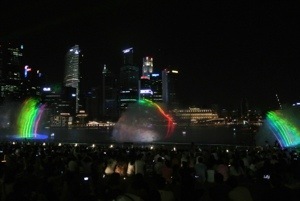 However, Singapore is brutally hot, so I would not suggest spending too much time exposed to the sun. The gardens are massive, we could have walked around all day. There’s also a Ginger garden and Orchid garden. On a daily basis, the infamous Marina Bay Sands puts on a water show complete with lights, fire, bubbles, and sound effects. 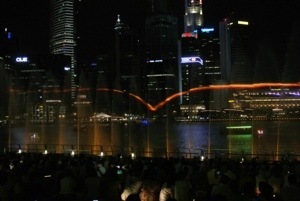 In the evening we made our way down to the staging area, which also has a full view of the central business district and the Merlion fountain. 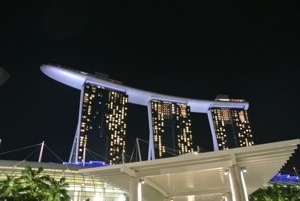 The show was pretty impressive, as is the Marina Bay Sands building, complete with a casino, shopping, theater, restaurants, a hotel, and supposedly the worlds craziest infinity pool. I was more obsessed with taking pictures of the actual building than paying to go all the way to the top, but we did ogle at the high end shops and enjoy some nice ice cream at Au Chocolat. I wish I had more time to explore and experience the culinary delights, especially in La Passat and Little India, but I have a feeling I’ll be back.